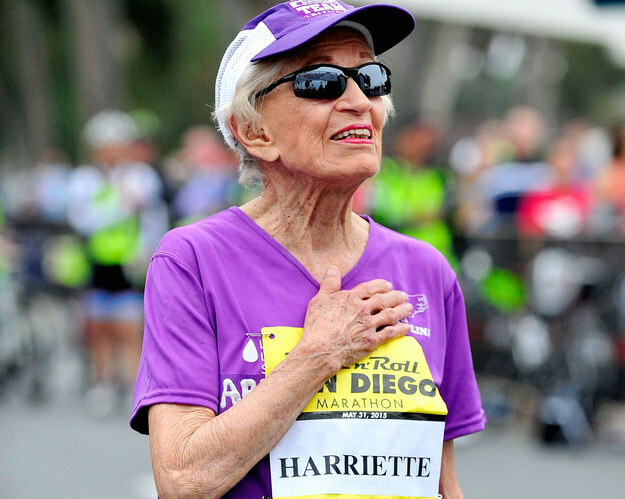 Two-time cancer survivor Harriette Thompson is now the oldest woman to ever run 26.2 miles. A 92-year-old woman on Sunday became the oldest woman to ever run a marathon after finishing the Suja Rock ‘n’ Roll Marathon in San Diego. Harriette Thompson finished the race with her 56-year-old son, Brenneman, by her side as screaming fans cheered her on. 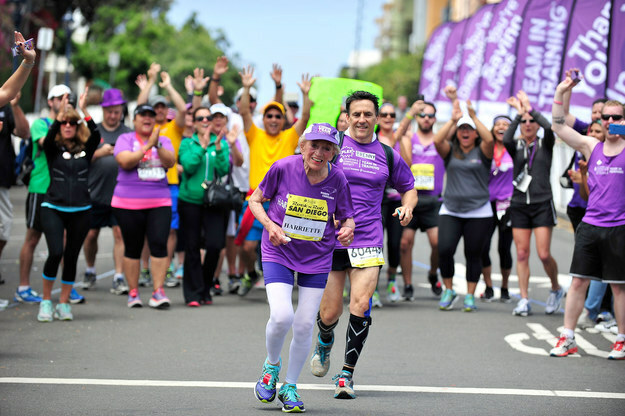 92-year-old Harriette Thompson is the oldest woman to complete a full marathon! That's #WhyRunningRocks! Thank you for rocking with us Harriette! Thompson, who has beaten cancer twice, runs to raise money for the Leukemia & Lymphoma Society. Over more than a decade, she’s raised more than $90,000 through running 16 marathons. The North Carolina resident told BuzzFeed News she started running when she was 76 after a friend told her she was running to raise money for the charity. She had planned on walking her first race, but ran instead. She even placed first in her age group. 92 years young! 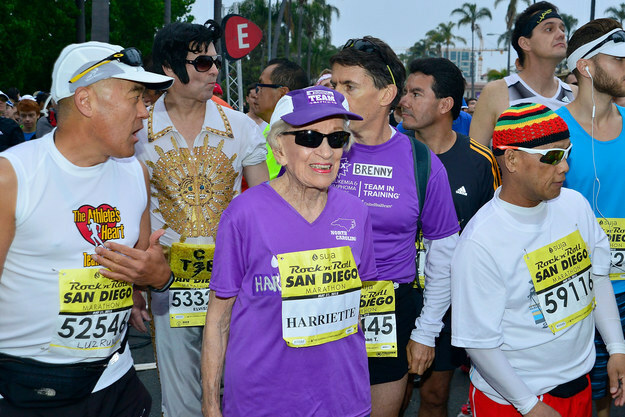 Harriette Thompson of Charlotte, North Carolina, will become the oldest woman to complete a marathon when she crosses the #RNRSD finish line today. This year was a tough one for Thompson. In January, Thompson’s husband died. She also battled a staph infection in her legs during training. 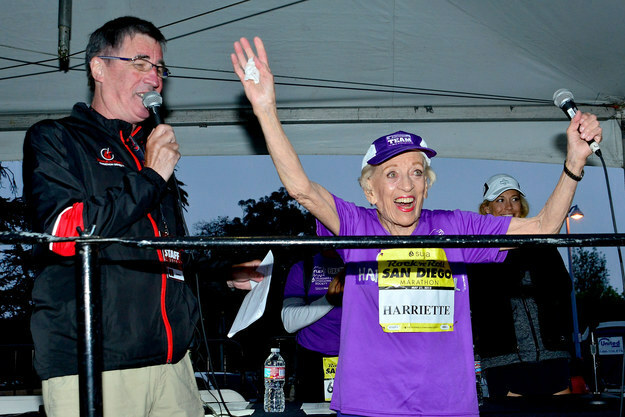 A year ago this weekend, Harriette Thompson, then 91, ran the fastest marathon ever by a woman 90 or older, finishing #RnRSD in 7:07:42. At age 92 she’s back for an #EpicSummerRun tomorrow and when she crosses the finish line she’ll become the oldest woman to ever complete a marathon. However, Thompson still found time to train and made it to the finish line Sunday. The former concert pianist says that she uses music to help her running. “When it gets a little boring, I start to think of a piece of music,” she said. Brenneman Johnson told BuzzFeed News he acts as both a protector and a motivator to his mom on her runs. Harriette has also run shorter races with her son in Charlotte.